The problem with browsing through cocktail blogs is that I invariably find someone else who is posting delightful, well informed information and my list of places to read increases. The Handy Snake is one of those, and I earlier wrote about Kurt’s Manhattan Special. Being a big fan of the tasty manhattan, I tried it out and was intrigued enough to recreate it with some slight modifications. Mainly, I don’t like drinking mine on the rocks, so I just reduced the amounts and ended up changing the proportions a hair. If you’re interested, I really recommend you check out the original. Shake with ice and strain into a cocktail glass. Garnish with a cherry. Note that Kurt makes a good point about wanting a strong rye to take on the Benedictine. I always like Wild Turkey in my Manhattans, and it serves well in this case. What’s up with the .3 and .4oz measurements? I tend to make a Manhattan at 3:1 rye to sweet vermouth, but that’s too weak if you then add Benedictine. You could certainly just do 1/4 oz each of vermouth and Benedictine, but I liked it better with a hair more than that, and adding more vermouth than Benedictine. The end result is a very soft and sweeter Manhattan. It’s handy for those times when you want a Manhattan, but aren’t really looking forward to it standing up and socking you in the mouth for the first few sips. Of course, I think that’s part of a good Manhattan’s charm, but this is nice to have in the recipe book. Thanks, Kurt! Yes, there’s a cherry there but I shook it instead of stirred the drink. This also dilutes it a hair more, in addition to making it colder quicker, which I think works well in this case. Actually I’ve been meaning to try that very drink, although only because I knew of it as an olde timey martini. 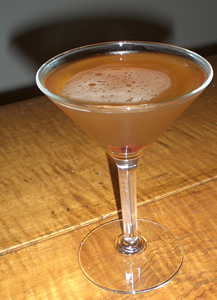 Historically, martinis have been made a much higher vermouth:gin ratio, and often used orange bitters (back when they were more available). In addition, some people maintain that a lemon twist is the only way to drink a martini, with the olive being a new fangled polluter of fine gin. Given the botanical nature of gin, the orange and lemon could certainly work to enhance the flavor, so I can see it. So that’s the first I’ve ever heard of it being called a “fitty-fitty.” I looked it up online, and it sounds like it’s coming out of Pegu, which I’ve heard of as serving good, classic cocktails. Alas, we live on the wrong coast for such things (I have to imagine at least LA has some decent cocktail bars, but I haven’t found a one here in San Diego). Finally, the thinking person should head on over to Drink Boy’s site for a wealth of knowledge about cocktails. I really do tend to like his taste better than some of the other sites out there. In addition, he has a recipe for Martini (original) that includes 1:5 vermouth:gin (which is not 1:1, but is much higher than the current trend), orange bitters and a lemon twist. He’s also the one that inspired me to put the Pegu cocktail on my “to try” list long before I’d ever heard of the club.